Note: While the information below is deemed accurate, this website makes no warranty or claim as to accuracy of the information provided. Please consult with a licensed Fiji real estate agent, law firm and/or accountant before investing. Q. What is the legal contract for purchasing real estate properties in Fiji? Any legal contract for purchasing properties in Fiji must be in writing and valid. The common law of contracts also similar to England and USA is to prepare a contract every time one sells or purchases a property. A sales and purchase agreement by the seller that is checked and approved by a certified lawyer prior to signing. For non-residents of Fiji, there are certain requirements that the seller can work through with both parties in order to the contract becoming unconditional. Q. Is there stamp duty payable? All transfers of properties prior to settlement and leases is payable on stamp duty. Stamp duty on property leases is payable to 1% on annual gross rent and 3% on real estate property. Non-citizen purchasers are now required to pay 10% real estate stamp duty..
Q. Is there Capital Gains Tax in Fiji? There is a 10% capital gains tax in effect on profits from the sale of homes or property in Fiji. Q. Can I as a non-resident investor obtain loans from commercial banks in Fiji? Non-resident investors can obtain loans from commercial banks in Fiji. The maximum loan is handled by the Reserve Bank of Fiji. Most buyers tend to use their own properties in their own country of residence as equity. Q. Can I use my real estate property purchased as security for a mortgage in Fiji ? Yes, real estate properties can be mortgaged as security for mortgage or debt. Most common mortgage source are banks and financial institutions in Fiji. ANZ Bank, Colonial Bank, and Westpac Bank are the most active in the market a proper and direct contact with the bank of your choice can be made by the seller. Q. How long does the transaction for a property take? A property transaction usually takes 60 days. However, delays may occur through government agencies but the seller can assist with attorneys to establish things more easily and effectively until settlement. Q. Can non-residents invest in a real estate property? 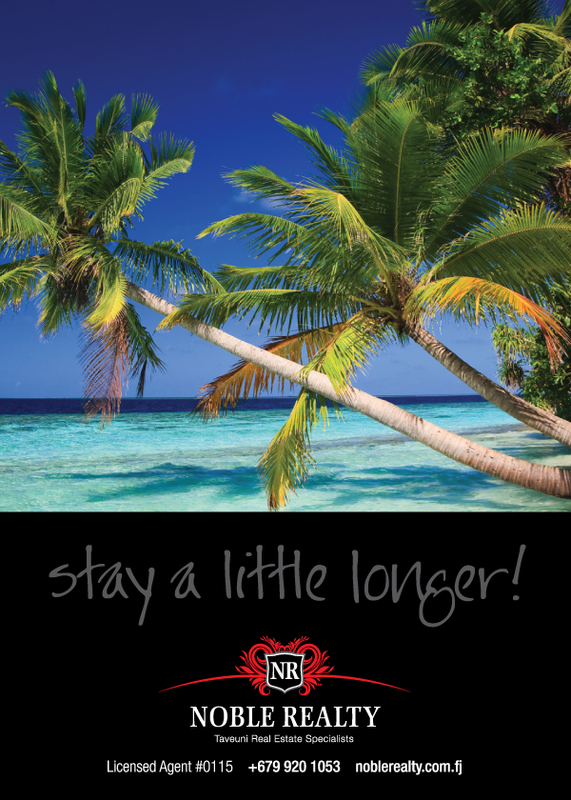 Yes, non-residents can invest in a personal real estate property in Fiji. However, freehold properties that are larger than one acre than approval must be made by the Minister of Lands of Fiji. Q. What forms of ownership is permitted in Fiji? Ownership of real estate properties in Fiji can be individuals or more than one person. Businesses and partnerships can acquire, hold and convey real estate properties in Fiji. Partnerships may be more than 20 people with one general partner. Trusts and joint venture can purchase real estate properties in Fiji, as well. Q. Can a non-resident marketer sell his property to another non-resident purchaser? Yes, non-residents can sell properties to another non-resident buyers. New developments in Fiji are purchased almost exclusively by non-residents for many purposes. Q. Will I need consent from the Minister of Lands Consent if I want to re-sell my property to another non-resident? Yes, consent is required by the Minister of Lands prior to dealing into a binding contract. This procedure is simply an application form filled and submitted by each party to the Department of Lands for approval. This usually takes from 2 to 8 weeks. Q. Are there Registered Appraisers in Fiji? Yes, and most of Fiji’s commercial banks have approved list of appraisers that form the bank’s panel of appraisers. Q. Can I let other people use my property? Yes, anyone can use your property with your arrangements. However, it should not be on a commercial basis. If there are intentions of earning income from the property then approval must be received from Fiji Trade Investment Board. The seller can recommend professional accountants to help structure the investment properly. Q. Where do we go to obtain approvals to set up a business or to earn income in Fiji? For approval to set up a business in Fiji, foreign investors need a Foreign Investment Registration Certificate from the Fiji Trade Investment Bureau, which encourages investment. This application can take up to 5 to 14 days. The seller can recommend professional accountants to submit and structure your application properly. Q. Where to go to get work permit(s) to set up a business in Fiji? Business permits can be obtained from the Department of Immigration, which is responsible for issuing work permits. Any investor seeking a work permit must invest at least $50,000 before they will be considered for a work permit. Q. Is it difficult to get a work permit? If all information requested by the Department of Immigration is provided, it will not be difficult to obtain a work permit. Temporary work permits are also issued in a reasonable time. A permanent work permit will not be issued until all requirements are provided, with clear police reports. Application fees and necessary charges apply. Q. What is the Expat lifestyle like in Fiji? Unlike most countries, Fiji is more relaxed, as it is not as busy and crowded. The lifestyle is great, and multicultural people reside in Fiji. Q. What happens on weekends or whilst on holidays? There is a lot to do on the weekends when one is in Fiji. There are many activities such as swimming, snorkeling, sailing, surfing, fishing, golf, tennis, bowls, exploring, village visits, shopping, and sightseeing to some of the beautiful islands of Fiji. Q. Is there VAT payable when I purchase a secondary sale property? No, VAT is not payable when purchasing a secondary property from private individuals. Q. Is there VAT payable when I purchase a new property? VAT is payable when purchasing a new property. The seller encourages one to seek independent legal advice to ensure the responsibility of VAT in the Sales and Purchase agreement. Q. Is broadband internet connection available in Fiji? Yes, Broadband internet is available in most locations of Fiji. Vodafone and Digicel now offer 3G wireless Internet service covering most of the country. Q. Can non-residents open an external account in Fiji? Yes, external non-resident accounts can be opened by most banks. They will be able to assist you with this requirement for the comfort of transferring currency overseas for your investment in Fiji. Q. Are developers subject to Tax on Profit? Land developers are subject to tax on profit. Profits that are delivered by entities dealing with sale of properties with intentions of making profits are subject to tax. You are generally not considered a land developer unless you have a very large acreage and are selling off different parcels or own several individual properties in Fiji. Note: While the information above is deemed accurate, this website makes no warranty or claim as to accuracy of the information provided. Please consult with a licensed Fiji real estate agent, law firm and/or accountant before investing.